THESE STATIONS OF THE CROSS painted by A. Vonn Hartung in 2001-02 are significant in their religious content in that they express a perspective that emphasizes the effect Jesus had on those present during his ordeal of carrying his own cross to his crucifixion on Calvary. As the bystanders are pulled into his suffering we follow by observing closely, the actual Revelatory conversion of the principal Roman soldier. “The Holy Family”, an illuminated high relief woodcarving in tropical cedar and mahogany measures 42 by 44-inches square, and testifies to the revelations, dreams, miracles and prophecy of the divine events leading up to and beyond the Incarnation of our Lord and Saviour Christ Jesus. Subtitled “The Faith of St. Joseph”, as it is in Faith that we hope and have our being in the triune God of the Father, the Son and the Holy Spirit. With reflections by the artist A.Vonn Hartung. 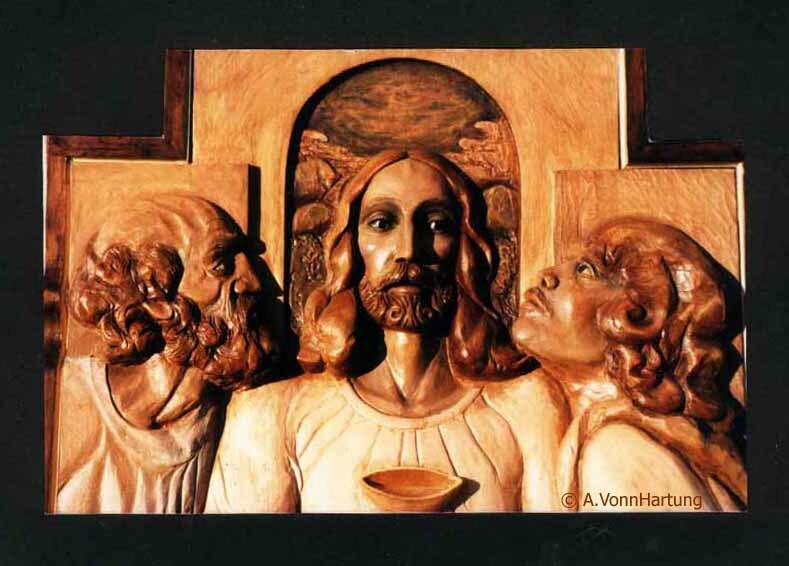 Sacred Catholic wood carvings of Saints Peter, Paul, and the Four Evangelists explained by the artist A.Vonn Hartung. These high relief wood carvings were completed in August of 2008 for the Ambo of St. Paul Catholic Church in Pensacola, Florida for Father Doug Halsema through the Liturgical art & architectural consultant Dr. Steven Schloeder of Liturgical Environs. The saints are all directed towards the center of the Ambo, as though they are again listening to and reliving the truth and reality of Christ Jesus that because of them and through them the gift of the Holy Spirit continues to live in us in the Liturgy of the Word. The background noise is a driving rain; listen for the amazing moment when the rumble of thunder reinforces the artist’s explanation! Some portraits I’ve painted on commission and for my own collection. One of my portraits of Blessed Carlos Manuel Rodríguez Santiago hangs in the Hall of Saints of the Pontifical North American College, Vatican.